***NEWLY REVISED*** IF YOU’VE ALREADY PURCHASED, THEN DOWNLOAD FOR FREE! Let’s play a math game! This huge pack of over 80+ pages of card games, board games, and assessment activities to practice 3rd grade math CCSS. 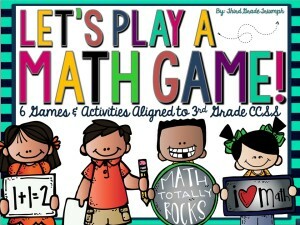 This is a perfect way to jazz up your math centers and instruction with this fun and engaging pack! Be sure to check out the preview! This pack is sure to engage your students and have them coming back for more! It’s a perfect way to break away from the ordinary and have your students practice math concepts in an engaging and fun way. They will have so much fun that they will forget they are learning/reviewing. My kids always beg for more!